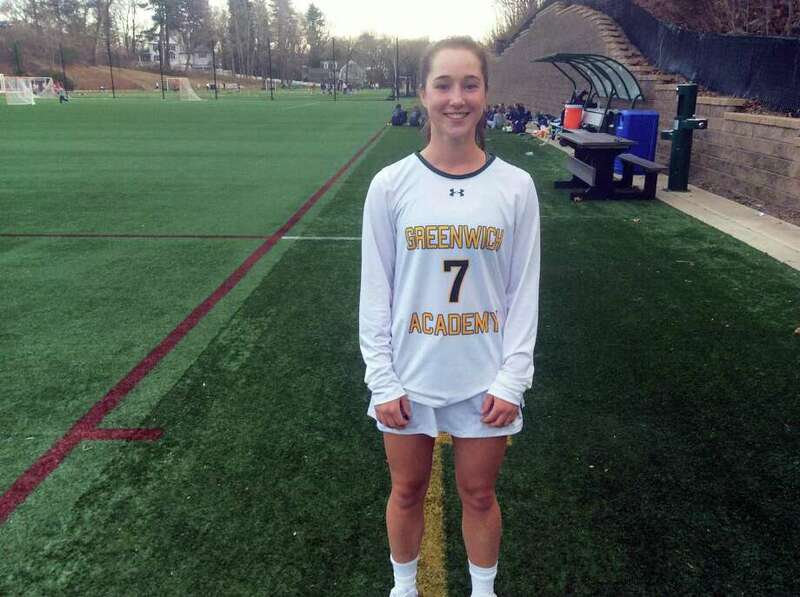 Tessa Brooks scored three goals in Greenwich Academy’s 17-9 season-opening win against Wilton on Thursday. GREENWICH — As its season-opener against Wilton illustrated, lighting the scoreboard shouldn’t be a problem for the Greenwich Academy lacrosse team this spring. Capitalizing on their opportunities from the outset, while playing sound defense, the Gators opened their season in fantastic fashion, registering a decisive 17-9 victory over visiting Wilton. Getting goals from seven players, GA displayed its multi-faceted offense throughout, making the most of a good deal of their possessions. Sophomore midfielder Margaret Maruszewski scored a team-high five goals, junior midfielder Tessa Brooks tallied three times and junior attack Katie Goldsmith recorded a hat trick to power Greenwich Academy (1-0). The Gators entered halftime with an 11-5 advantage, behind crisp ball movement and on-target shooting. Junior midfielder/co-captain Taylor Lane notched two goals and one assist for GA, which received 10 saves from sophomore goalie Cate Spaulding. Junior Anna Sherman posted four goals, while junior Sophie Sudano lit the scoreboard three times for the Warriors, who also played their season-opener on Thursday. Wilton seemed to improve offensively as the game progressed and tightened up its defensive play in the second half. Eliza Bowman, a junior attack, had two goals, while sophomore midfielder Paige Lipman added one goal and one assist to also pace Greenwich Academy. Lane opened the scoring, tallying off a turnover with 22:54 left in the first half. Wilton tied the score at 1-1 when Olivia Gladstein, a junior, tallied off a dodge at the 22:07 mark. The Warriors briefly went ahead, 2-1, on Sherman’s goal with 21:03 to go in the first half, but GA took the lead for good with three unanswered goals. Maruszewski converted a free position shot, then Brooks went top shelf with her perimeter shot, which got past Wilton goalie Bridgette Wall, making it 4-2. After Sudano scored off a free position shot, Goldsmith scored off a dodge, then Lipman tallied in transition, giving GA a 6-3 edge. Junior Grace Schulze set Goldsmith up for another goal, putting Wilton in a 7-3 hole. Brooks converted a pass from Goldsmith and Maruszewski added two more first-half goals for the victors. Wall made six first-half saves and Kate Paulson stopped six second-half shots for the Warriors (0-1). Greenwich Academy was sparked by senior co-captain Leila Schneider defensively and junior Binney Huffman. Besides her three goals, Brooks enabled Greenwich Academy to carry the momentum by winning the majority of the draws that she took. Scoring: GA — Eliza Bowman 2 g; Tessa Brooks 3 g; Katie Goldsmith 3 g; Maddie Holden 1 g; Taylor Lane 2 g, 1 a; Paige Lipman 1 g, 1 a; Margaret Maruszewski 5 g; Grace Schulze 2 a; W — Anna Sherman 4 g; Sophie Sudano 3 g; Olivia Gladstein 2 g, 1 a; Julia Skillin 1 a; Carly Sullivan 1 a; Goalies: GA — Cate Spaulding (10 saves); W — Bridgette Wall (6 saves), Kate Paulson (6 saves). Records: Greenwich Academy 1-0; Wilton 0-1.